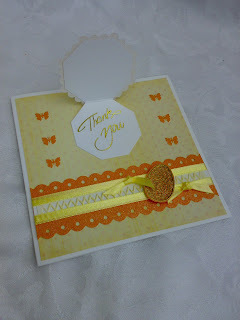 Simply One of a Kind: Multi Challenge Thank you! My daughter needed yet another thank you card for a gift for her daughter. This time it was for the cutest duck and an Easter Egg (although my daughter will probably eat most, if not all of the egg). We met up with my daughter-in-law's mother for lunch at a pub in Chichester last weekend. She arrived with arms full of gifts for Daisy. As the pub was called the Gribble, that is now the name of the duck. 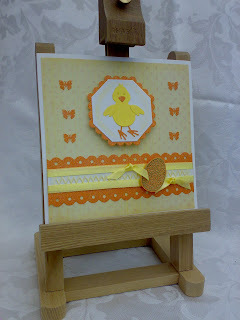 This card includes the duck and the egg! These are the challenges that I think this card qualifies for. 1. One Stop Crafts Challenge #23 All sewn up. The sewing for this is embossed... a first for me! 2. Daring Cardmakers, Hide and Seek. The message is under the flap. 4. Pink Elephant #9 Stamps, Embossing and Punches. The egg is stamped and heat embossed, the stitching is embossed and the butterflies are from an X Cut punch. 5. Our Creative Corner, Favourite... Easter. My favourite is this fabby little Quickutz duck! I don't think that I've ever managed five in one go before, quite a record! ps like your new blog design, was it inspired by Daisy? Fabulous card, but an even more fabulous baby. What a cutie pie! love the card but I agree with the others the baby wins hands down. Oh I so want to be a Grandma!! Oh wow Chrissie waht a cute card, love the image and hidden message ~ gorgeous... and just as gorgeous as the pic. AWWW - gorgeous - Daisy that is!! Great card as well. Love the colours and that cute image. The details are fab - especially that embossed egg. 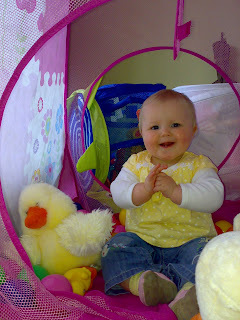 Beautiful baby Chrissie ... she looks so happy and contented. Awwww, how cute!! Love the chicks! Super cute card and your baby girls is so precious!!! Thanks for including the OCCC in your post :)!!! super cute - and 5 is quite a feat!! Great card for the DCM's dare this week. That little duckie is so cute! Cute card Chrissie but I have to say…….Daisy is a real cutie-pie. The detail in this card is great! That's great you were able to accomplish so many challenges with something so pretty!